I have mentioned previously that the one newsletter I love is the one from Buy.com. They truly give out some awesome deals! I had purchased my Kingston DataTraveler 2GB USB Flash Drive from Buy.com a few months back. Now, it is again on sale for $16.95 with free shipping! I have ordered another one to keep it as a replacement for my current drive when it decides to break. As I have it in my keychain, it goes through some pretty rough handling but it is looking good so far. For those who have been wanting to try out portable apps or create a swiss army knife of portable tools, this is your chance to get in on a sweet deal. Or if you have been wanting to hold a blog contest, this is your chance to snag a cheap price! I know I had mentioned $6.95 in the title and here is how you get it. Buy.com offers $10 off for new Google Checkout customers. 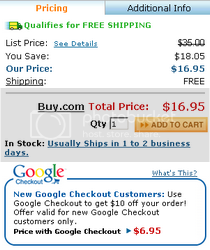 If you already have used Google Checkout before, no worries. Take 2 minutes to create a new GMail account and use it to order this. You will get $10 off on this purchase. I use PassPack (review) to keep track of all the new accounts I create. Enjoy the freedom you get with Portable Apps! Absolutely buddy! 🙂 And congratulations on the new authorship! Wowsers…that’s a great deal. It’s very tempting, but I do already have a 2GB drive. Hey Ryan.. welcome to ShanKri-la! I succumbed to the temptation and ordered one! Also I ordered this Kingston 2GB SD Card for $7.95 FS (after Google Checkout discount) from Buy.com with the flash drive! why does the article title say $6.95?